This tasty and aromatic vegetable relish is made with a delicious blend of ripe peppers, tomatoes, aubergine and spices. Thanks to its mild and mellow flavour, it works as the perfect accompaniment to just about anything, including grilled meats. 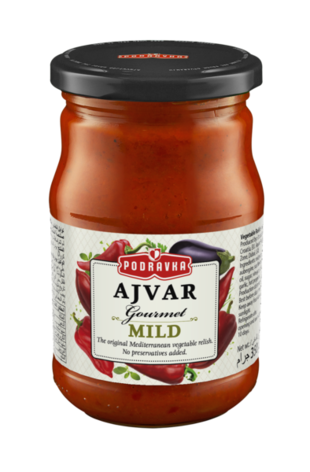 Usage: Chutney (Ajvar) is suitable for a modern combination of meals ingredients, but also for the preparation of traditional dishes. Can be used in its original form, as a side dish with grilled meats, sandwiches or as an additive to sauces, stews, soups, etc. Ingredients: peppers (83%), aubergines (7%), vegetable oil, vinegar, sugar, salt, garlic, chilli pepper. Storage: Keep in dry place at room temperature protected from moisture. After opening keep in the refrigerator and use within 10 days.